Congratulations to Mr. Sirachai “Shin” Arunrugstichai, an award-winning photojournalist and an alumnus from the Class of 2010. 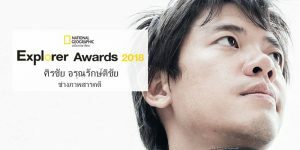 Shin was chosen to be one of the 10 awardees of the “National Geographic Thailand Explorer Awards 2018.” Holding a BS Environmental Science degree, he is also one of the MUIC Outstanding Alumni Awardees in 2016. This is the first time that the National Geographic Thailand Explorer Award was held. It is given to explorers who put their passion and faith in their work and in the process inspire other people. The awarding ceremony will be held on August 10, 2018 at 4.30 p.m. at Explorers Fair Hall 105, Bangkok International Trade and Exhibition Centre.